In the last few months, building talent communities on LinkedIn with like-minded individuals got a lot easier. First off, they have made a bunch of changes to groups that make it easier to host job feeds and distribute jobs to your group discussions. However there are a couple other more subtle changes that really made an impact on building communities on LinkedIn. Until recently, one fundamental thing was missing; the ability to easily determine a user’s interests on LinkedIn, but this has all changed thanks to a ton of new developments to LinkedIn’s Updates, Companies, & Groups sections. 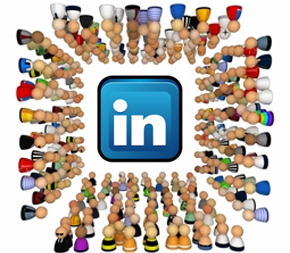 It used to be, that in order to to find users interested in a particular topic on LinkedIn, you had to find a related LinkedIn group and join it. Want people interested in Mobile Technology? Join a Mobile Apps group on LinkedIn. Or, you could start one and then just hope people find it. The only other way was to find users based on their interests was to make assumptions based on work history. Use keywords and company information to assume what the candidate’s interests are, maybe there is enough information to determine this. The problem with these strategies is that it left a large number of users’ interests a complete mystery. Think about it: no one is going to write how much they love their Mac in their LinkedIn profile. People don’t usually share their passion for a nice cold Coca-Cola in their LinkedIn work history. However, people might share these interests on Twitter! On the employment side, not many people will ever edit a LinkedIn profile to reflect how their interview went this afternoon, but they tweet about it! Give LinkedIn users the ability to search updates with the addition of LinkedIn Signal. This is a powerful combination for anyone looking to target LinkedIn users that are engaged in relevant conversation. This goes beyond mere “resume” type data to unlock topics that may spark dialogue with your new recruits. No big deal, Twitter, Hootsuite, and TweetDeck have had this ability for a while right? While true, the disadvantage of these services was that they were not always connected to a LinkedIn profile. You can’t sort HootSuite by “current employer” or where they went to college, but you can now with Signal. I want to end with one last caveat: I love the Follow feature on LinkedIn for the same reason! I don’t like it for all the obvious reasons like all the new hires and departures about which I can be alerted. But if I want to do some employment branding this is a perfect pool to be diving into. Someone following my company on LinkedIn equals someone that has shown some sort of interest in my company. A few simple invites to your companies’ followers can get your company careers group up and running real fast! We’ve repeated this with some tremendously high acceptance rates. For example, Ferrari has 18,000+ followers. The displayed followers are random so mess around with the number at the end of the link (example below) to find lots of new people that may already be interested in your employment brand! Adam Wiedmer has provided sourcing, recruitment, and hiring process design solutions to a variety of Fortune 500 clients. His focus to date has been primarily contracts for high-volume global recruitment efforts that have spanned industries such as insurance, automotive, pharmaceutical, and telecommunications. Aside from recruiting, Adam is a dedicated musician and spends his time attending concerts, playing bass, and writing music.